It’s that time of impending fall when young loons, not yet mated for life, gather in adolescent gangs around Maine’s lakes and ponds. During the day they practice take-offs with flailing wings and loud inexpert splashing. Some day, they will surprise themselves and actually lift off the rapidly chilling water, embracing their ancient migratory urges. At night their calls to absent parents and the lake’s night time sky are so loud they wake us even when dawn is a hint of gray. Read more . . . Sometimes, for inspiration, I search out memorable words about words and the process of writing from great writers. Here are some of my favorites . 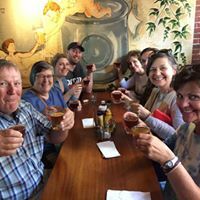 . .
See my July post on the Maine Crime Writers site for insider tips on enjoying the Boothbay Maine region (including new Foodie Tours---courtesy of you know who)! Tips on how to find a bit of the "real" Boothbay, and the "real" Maine. In my latest post on the Maine Crime Writers site, I talk about the woman who wrote, "It's never too late to be what you might have been," a woman named Mary Anne Evans. Evans became one of the most famous and enduring writers of the Victorian era---under her pen name, George Eliot. In the spirit of aspiring writers becoming what they might have been, I then shared some of the priceless tips I picked up at the recent Maine Writers and Publishers Alliance event, Crime Wave. Read the post on the Maine Crime Writers site.